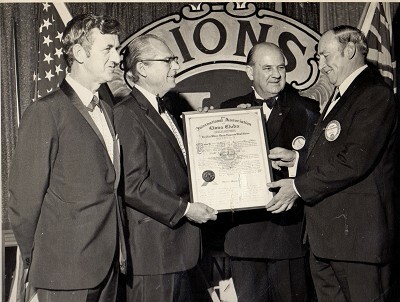 The Lions Club of Heathcote was presented with its Charter on May 15, 1971 by Lions International President, Dr Bob McCullough of Canada. The official dinner was held at the Brolga Hotel (demolished 2009), Lake Eppalock. In 1971, Heathcote was only the second club in Australia to have been honoured by a visit from an International President. Pictured on that momentous occasion are (from left), Bryan Armstrong (Bendigo Lions Club President), Dr Bob McCullough (Lions Club International President), Geoff Patience (District Governor 201) and Allen Stephenson (first President of Lions Club of Heathcote). Heathcote Lions Club was Chartered on 25 March 1971 with 21 Members. The formation of the Club was instigated by the Bendigo Lions Club. Lions Club of Heathcote was Chartered on 25 March 1971 with 21 Members. The formation of the Club was instigated by the Bendigo Lions Club. The first regular club meeting was held on 20 April. Heathcote Lions Club was instrumental in having the Heathcote Ambulance Service established. Heathcote Lions through a raffle, together with local schools, Clubs and sporting bodies raised $4390.00 for the purchase of a Cardiac Monitor & Defibrillator. Lion President Jack Fasso initiated Lions Playground at Barrack Reserve. The Playground was opened by Brian Dixon MLA (Minister for Youth, Sport & Receation) and Lions President Jack Fasso on 23 December 1978. Letter sent to local Guide Association seeking permission to use the Guide Hall for meetings [6 February]. A reply was received on 20 February agreeing to the request. On 7 May, it was Moved A. Lonergan, Seconded R. Irvine, that the club pays $60.00 to have the Lioness Club of Heathcote Chartered. This is finalised on 23 July. The Lions Club of Heathcote donated a 'Gong & Gavel' [18 July]. The Charter was withdrawn in February 1982. At a meeting on 4.8.82 a vote was taken to reform the Lions Ladies Auxiliary, 15 in favour of Auxiliary, 1 for Lioness to continue. 10 Year Anniversary Dinner celebrated at Brolga Hotel, Lake Eppalock. Lions playground extended with extra equipment installed. The construction of these Units became a Club project. Construction of first 3 units at Lions Estate commences. First residents move in to completed units. Greg Speirs became Co-ordinator for RCH Appeal. The second set of 3 Lions Units was opened. 20th Anniversary. 9 Charter members still serving. The 3rd set of 4 Lions Units opened. First Lions calendars were ready for distribution in the town by members [December].In 1999 the calendars were made available in the current larger size. Charter Member and 1st President, Allen Stephenson passed away 25 October, aged 75. Lions Ladies donate $1375.00 to Lions Estate Management. Club inducted first female member, Sharon Stringer. Club newsletter, 'The Bulletin', goes back into print after a gap of many years. Harold Fraser is President [July]. To assist Dairy Farmers in the Gippsland region who were experiencing severe drought conditions, Lions together with the Heathcote community put in an outstanding effort in the true Australian tradition. Hundreds of cattle transported to local farms for agistment free of charge, with Harold Fraser taking a number of calves to look after. In late 1997, Scrapbooks commenced being compiled to keep an archive record of Lions events & history as it was reported. Current Bylaws of Heathcote Lions Club Inc. be abolished and new Bylaws be written to suit current members. Possibly the biggest fund raising effort ever undertaken by Heathcote Lions was the 'Australia Day' Raffle. This commenced in September 1997, with the first draw being held in 1998. The prize of a trailer (constructed by Lion Ray Johnson and all others that followed) was filled with a multitude of items. Total prize value was $1400.00. 2nd prize was a $100 petrol voucher. Ticket sales were initially only sold in Heathcote. However, after the success of the first year it was decided to move further afield. The trailer was displayed at, Bendigo Market Place, Lansell Plaza, Bi-Lo (now Coles), Strath Village and outside the Medicare office in Queen Street (Bendigo). Members who did duty towing the trailer were given $10.00 for petrol. There is no reference of the raffle going beyond the drawing at the Australia Day celebrations in 2003, which raised $3092.00. In 2000, the raffle realised a profit of $4300.00. Two more female members join, Di Fraser & Thelma Johnson. Charter Member, Jack Fasso passed away in January. The fourth set of 2 Lions Units opened. Pat Connally - 10 Years as Auctioneer for the Easter Anything Goes Sale. Playground equipment purchased to the value of $5000 [July]. Playground celebrates 21st birthday. Lion Greg Speirs (Secretary Estate Committee) gave a report to a meeting held on 5 May. Being unable to borrow money the land title had been passed to Shire of McIvor who arranged for finance to construct the original units. Finance consisted of Shire monies, Grants & Lions funds. The Lions Estate Committee of Management was setupas an Incorporated body with a Constitution. The Lions Estate was accepted as a major project for Heathcote Lions and has been conducted as such since. It was agreed that the Estate is an integral part of the Heathcote Lions Club and will continue to be managed/developed as a major project. At a meeting on 2 June it was stated that 63% of the current members were over age 65. It was asked if they should be doing work as physically demanding as they do? 3 Charter Members pass away, Pino Zoanetti, Frank Barri & Phonse Lonergan. Life Saver' cylinders become available. From the 'Heathcote Lions Club Bulletin', December 2000, 'AUSTRALIA DAY RAFFLE' - In the rain: The President's Message (Lion Bruce Knight) - Well I may have actually created a record that, hopefully no-one will emulate - Just over 2 hours on the Australia Day Raffle and not one ticket sold. Thursday, 16 November was a notable day for Heathcote when 3 inches (75mm) of rain fell in the town in a couple of hours. Luckily they did not have the Trailer. Bruce has gone onto better things being a successful seller of wood raffle tickets with John Ayres. 30th Anniversary Dinner held at the Golf Club. Units 11 & 12 opened at Lions Estate. Lions President, Alex West passed away whilst in Office, 8 December. Lion Di Fraser became the first female Club President. Following a letter from the Astronomical Society in October, the club conducts the first Stargazers BBQ at the Leon Mow Dark Sky site. [4 December] This association with the Society still continues. Lion President Di Fraser passed away whilst in Office, 24 February. Lions take over the running of the Harold Baigent Memorial Art Show from the Girl Guides, who had run it since 1988. (2012 sees the largest Art Show exhibition with 191 paintings displayed.) The Art Show is now held over the first weekend in May, previously held in October. Catering trailer receives an upgrade. Carried out by Lion Alister Trease. Lions assist with finance for Ron Bell (Blackburn North Lions & PDG - 2001/2002), a Polio victim, for an Orthotic Leg, known as Knee, Ankle, Foot Orthosis (KAFO). It is a specialised unit (Leg) developed in the USA and at this time was the only one of its type in Victoria. Heathcote community hosted 'Great Victorian Bike Ride', stopover at Heathcote Showgrounds of 4000. Lions assist with catering. Charter Member Bert Perry, passed away 29 May, aged 77. Previous to 2007 Heathcote Lions formed part of District 201 V1, this was changed to 201 V1-4 from 2007. The first DG for the new District classification was Ross Wood. Charter Member Trevor Campbell passed away 25 March, aged 76. Club awarded Lions Top Club & Community Service awards of the District. Lions Unit 15 opened. This unit was built entirely by funds from Heathcote Lions. Charter Member Bob Hird passed away in September. Skate Park opens November/December 2009. Lion Ian Hillier passed away 9th January, aged 54. Freezer purchased for Ice-cream sales for catering [February 2010]. 5 members inducted including Cameron Barr posthumously. Cameron had been accepted as a member but had not been inducted before he passed away. Female membership in the club outnumbers males for the first time. The last of the Units (16 & 17) occupied. February: From Lions International - The club membership (worldwide) has increased by 50,000 over past 4 years. More than 300,000 are women (23%). Heathcote has 37% women members, which is well above the world average. Modernisation of Catering Trailer completed. First outing was on 25.02.12 to Stargazers. At the invitation of C.O.G.B., Lions F. Dailey, R. Johnson and G. Speirs visited units at Geelong & Castlemaine to see an alternate approach to body corporate.They were impressed with Winteringham Housing Association that had 34 units valued at $8Â½ million (only 12 months old), they were well maintained, but dearer in rent and other necessities. Lions donate $1000.00 to 'Odd Bods'. This group was formed in 2007 and participate in the Cancer Council's 'Relay for Life'. As of the donation in 2012, Lions have donated $4300.00 to this very worthy cause. Charter member, 'Jock' Granter passed away 14 May. Market trailer for trestles constructed by Lion Alister Trease, body donated by Morgan's Smash Repairs. Due to ill health, Lion John Hicks, who for many years held the position of Bush Market Chairman stepped down as of the Changeover (22.06.12). John also held the position as Organiser for 'Carols in the Park'. Ian Owen appointed to the position of Bush Market Chairman. After 15 years as the 'Mint Man', John Ayres retires from the position at the Changeover meeting held on 22.06.12. Position taken by Lyn Furneaux. Membership as at 10.08.12 - 33. One new member waiting to be inducted. At December Business meeting (5th), letter received from member Jack Battersby advising he was resigning due to leaving the District. Jack was a past Club President. Jack was inducted on 19.02.2003 by DG Eric Gittens. Alister Trease was the Sponsor. Lions hold annual 'Carols in the Park' (8th). 14 helpers attend with Catering Trailer to the Stargazers Christmas Breakup (15/12). Pleasing to see such a large number of Lions attend, which helped spread the workload. 16/12 saw a total of 37 Lions members and partners attend the Christmas Breakup and the Presidents house. Partners Fred Thies & Ray Anderson manned the BBQ preparing a 'feast fit for members'. Pleasing to see Harold Fraser, Jim Marshall & Jack Battersby there. A great day enjoyed by all. Lions Caroline J, Alister T, Daryl D & Jeanette D attend Zone Coffee in Bendigo. Lion member, John Hicks (Hicksey) passed away on 20.01.2013 after a long illness. John had been Chairman of the Bush Market and had been actively involved in organising the 'Carols in the Park'. The annual Art Show, held over 3 - 5 May sees 211 paintings displayed. May 11 - What a day! Catering trailer in use for Heathcote Connect event. Free sausages. Busy Busy from mid-morning until 1.00pm. Then take trailer out to Mia Mia for another BBQ for the rock band, Cosmic Psychos. 350 people gathered in a quarry to hear the band perform before heading into Castlemaine to view a film which featured the band. This was a 'first', as the club had never done 2 BBQ's on the same day. June 5 - City of Greater Bendigo allocates $100,000 for upgrade to Lions Playground & BBQ area in High Street. June 12 - Lions members, J & D Dedman, L & S Speirs, Ray Johnson, Daryl Wallace meet with 2 Council people (Lincoln Fitzgerald & Aran ??) to discuss how money will be spent. July 7 - Contact Bristol Brunel Lions club (UK) asking if they will be a 'twinning' club with us. Twinning is similar to a 'sister city'.July 17 - Nicole Ballina of the Leukaemia Foundation is guest speaker at the July Dinner meeting held in the Bowling Club. August 6 - Lions Daryl & Jeanette Dedman and Meredith Greet attend Volunteer Week at the Bendigo Campus of La Trobe University with PDG Jill Qualtrough. August 7 - Bristol Brunel Lions Club accept offer of 'Twinning'. August 27 - Bannerette, Club newsletter & community n/letter (The Ranges Link) sent to UK club. September 10 - The AGM of the Lions Estate was well attended by Lions members, and included, 4 of the tenants, Dan Douglass (Heathcote Health CEO) and Wayne McKay (Heathcote Health Board member). The Executive is, Caroline James (President), Greg Speirs (Secretary), Ray Johnson (Treasurer & Senior Vice President), and Frank Borrett as Junior VP. Committee members are: Meredith Greet, Daryl Dedman, Frank Dailey, Daryl Wallace & Alister Trease. September 18 - Raeleen Stuart inducted as a member, and her husband Gary, as a Partner member. September - Club receives a grant of $500.00 from the Heathcote Community Bank to help offset cost of purchase of a Christmas Tree. in researching Alzheimer's disease which is the most common form of Dementia. October 12 - Club caters for Rock Drilling competition held by Mandalay Resources at the Showgrounds. Mandalay donates $500 to the Club. October 21 - Copy of the book, 'Lions Club of Heathcote' sent to Bristol Brunel Lions Club in UK, together with a copy of The Ranges Link and October issue of club n/letter. The newsletter for October featured colour photos. October 22 - Lions Club was presented with $17,000 from the Heathcote & District Community Bank 'Community Grants Program'. Night attended by Lions Daryl D, Jeanette D, Lyn F & Frank D. Money to be used to offset cost of new playground equipment. Approx cost $27,000. October 25 - Meeting with Pauline Gordon (CoGB) & Dan Douglas (H'cote Health) to discuss transfer of Units to H'cote Health. Lions attending, Greg S, Daryl D, Frank D, Ray J & Daryl W. Further meetings to be held. October 29 - Opening of Skate Park by Mayor, Cr Lisa Ruffell, with 2 other Councillors in attendance (Rod Campbell & Mark Weragoda). Lions Club President gave a short speech to thank City of Greater Bendigo. October 30 - 5th Wednesday. 21 members and Partners attend Axedale Hotel. November 14 - The Club President and wife (Lion Jeanette) attend Heathcote Health AGM. Lions members employed by Heathcote Health were presented with Service certificates - Frank Dailey for 5 years, and Lorraine Binney, 25 years. December 5 - President & wife attend Holy Rosary Primary School to present William Tobin with $400.00 Lion Ray Morgan Scholarship. December 14 - 'Carols in the Park' was a resounding success. This was due to the work put in by Lion Frank D and his team. Not all were Lions members, which showed that people from the community in general have an interest in seeing that the Carols become an event the town can be proud of, and they certainly achieved that! We estimated that the crowd numbered between 300 - 400. It was a shame that a cold southerly wind took the edge of the night. The Christmas Tree looked a treat when lit up by Lois Purdon, who was the lucky winner to turn it on. Being placed on the roof at the Information Centre certainly is an attraction for the townspeople and those passing through in the darker hours. Thanks to Rob Malavisi. December 15 - The club break-up saw 40 in attendance. We also had the pleasure of the District Governor, Stan Falloon and his wife Robyn together with the Zone Chairman, Wayne Drummond and his wife, Denise. Cooking on the BBQ was done by Fred Theis & Ian Furneaux. The DG presented Service awards to Alan Smith (45 years), accepted by his wife Pat as Allan was in hospital, Harold Fraser (40 years), Frank Dailey (25 years), Daryl Wallace (10 years) and Ross Jeavons (10 years). December 17 - Lions Meredith Greet & Raeleen Stuart attend the Heathcote Primary School to present $400.00 Lion Ian Hillier Scholarship to Jye Formosa. Lions Robin Hutson & Meredith Greet did initial organising for both presentations with the certificates designed by Rosie Hill. January - President forms a 'Market Committee' of 6. Lions Meredith G, Lyn F, Greg S, Frank D, Ian O (Market Manager) & the President. Committee to review Bush Market operations and report to Business meeting on February 5. First meeting 8 January. January - Week commencing 13 January. The state of Victoria endures a week long heatwave of temperatures exceeding 40 deg. February 14 - Lions Club of Heathcote Facebook page online. February 28 - Lions President Daryl together with Greg S, Jeanette D and Lorraine S met with CoGB Public Space Design Unit members to discuss (again) the upgrades to be carried out at the Playground and BBQ area. We await a suitable response. March 1 - The Astronomical Society of Victoria Inc. held their Messier Star Party at the Leon Mow Dark Sky Site. 9 members along with the catering trailer travel out for our first BBQ there for this year. March 4 - Members* of the Heathcote Lions Units Committee met with CoGB representatives (Deb, Toni & Glynn) to further discuss the handover of the Units. March 5 - The Business meeting agreed to the following main items: Purchase Laptop computer for incoming Secretary, Gazebo at 'Valley of the Liquidambers' to be painted and new sign made, RailTrail subcommittee formed, Lion Meredith showed sample of winter jackets to be purchased. March 8 - Letter sent to Garry Long (Friends of the Bendigo-Kilmore Rail Trail) advising that an Investigatative Sub-Committee has been established to look into provision of a Shelter on the Trail in the Heathcote region. March 10 - With sunny weather and a 9am start, Lions Lorraine Binney, Frank Borrett and Ray Johnson commenced painting the Gazebo. Painting continued next day as a second coat applied and table and chairs done. March 11 - Yearly Finance Committee meeting is held. March 12 - Bush Market Sub-committee meets to finalise Rules and Conditions relating to Stallholders. President & Frank Dailey to meet on 20 March to prepare a draft of Rules and Conditions for consideration by the Sub-committee. March 15 - With catering trailer in tow, members of the club participate in the Heathcote 'Connect Event'. March 20 - President & Frank Dailey meet and finalize Market rules. To be presented to Business meeting on April 2. March 31 - Rail Trail Investigating Committee (Lions Peter B, Fay & Ian D) meet with Garry Long and members of CoGB to discuss site for proposed Refuge Shelter. April - Heathcote & District Community Bank approve a grant of $1000.00 to allow purchase of Polar Fleeces (Delivered 19.04.2014). April 6 - Order for new design of club Bannerette placed with FDL Screencraft. 50 Bannerettes received 17April. April 10 - Lions Lyn, Jeanette & myself (The Prez) meet with Terry Canfield and Orrin Hogan from CoGB at the Liquidambers Lions Gazebo. The purpose was to discuss the erection of a table and bench seats (similar to Barrack Res) near the Gazebo. A site has been found, which all are in agreement with. Cost will be +/- $2900 fully installed. Orrin has agreed to do the basic paperwork regarding the installation and contacting the manufacturer. Further discussion on this to take place at the Business Meeting. April 13 - 10 Lions members plus Liz Spillane from ‘Friends of the Rail Trail’ carried out an inspection of the area in which the proposed shelter may be erected. Peter Baldwin & Fay Dawson gave those in attendance an excellent overview of what is proposed for the area. We look forward to further reports as the project moves forward. April 19 - Pola Fleeces distributed to most members as they attended 'Easter Anything Goes Sale' and BBQ. *April Business Meeting Item: New Bush Market & Gazebo Signs. New signs for each end of town have been ordered from David Whiteway of Swiftsigns. A draft of the design was shown at the Business meeting. The club is also now in possession of the sign to be placed on the Gazebo. Bush Market signs obtained by Lions Partner, Ray Anderson from Swift Signs on May 3. April 20 - New sign placed on Gazebo by Lions Alister T & Club President. April 30/ May 3 - Set-up for Harold Baigent Memorial Art Exhibition. Opening night (May 2) well attended even though raining. President thanked Lion Caroline who has decided to stepback from the orgainising side after a term of 9 years. The 2015 Exhibition will be under the control of Lion Rosie Hill. May 2 - Lions Bush Market Manager, Lion Ian Owen, is interviewed by phone by 'Fresh' 101.5 FM radio station in Bendigo. May 6 - Club President and Lion Jeanette D meet with Anthony Sheean (Senior Enviroment Officer, CoGB) to discuss and formulate catering arrangements for National Tree Planting Day on July 27. Anticipated 100 attending. Quoted cost $8.00 per head. May 17 - Lions Lyn F, Meredith G and the President attended the Club Leadership Development Day at Marong. May 21 - At the Dinner meeting, saw Lion Alister Trease retire from Lions after 14 years service. His expertise with catering will be missed. May 22 - Lion Greg S and Lion Partner Ray Anderson erect the new market signs at each end of town. June 2 - President Daryl, together with Lions members, Greg Speirs and Frank Dailey attend a meeting with the Heathcote Partnership Group regarding an Agenda item to move the Lions Playground from its present location. The club does not accept this proposal. June 15 - Lions members carry out shrub planting at the Skate Park. June 19 - Lion President Daryl & Lion Meredith attend new resident meeting at the CoGB Hub in Heathcote. No one showed up. June 20 - Club Changeover. June 24 - Petitions started to be circulated around the town in an effort to gain support that the Lions playground remain in its current position (next to CFA) after the CoGB formulated plans to have it moved up near the Information Centre. The club was totally against such a move. The community support was overwhelming, with over 880 signatures collected. This however did not satisfy the CoGB, with the matter still being needed to be discussed by Council. June 25 - Nine club members journeyed down to Wandong for the Wandong Wallan Changeover. July 20 - Lion Frank & Prez plant 100 further shrubs at the Skate Park. July 23 - AGM of Lions Estate. Lion Frank Dailey elected as President after Lion Caroline J did not nominate for re-election. July 27 - 6 members of the club cater for those attending the National Tree Planting Day just off Herriot Street. Even though the sun was shining, a very cold wind made things rather unpleasant. The number of tree planters was disappointing with only 34 people attending to brave the cold, however, the busy beavers planted 3400 trees and the club was paid $400 by the CoGB. Thanks to, Lions Jeanette, Lyn, Lorraine B, Peter and Frank, the ‘Trailer Tower’. Aug 13 - Saw the installation of our table and bench seats at the Liquidambers. (See Gallery section for photos). Aug 20 - It was great to be at the Dinner meeting and receive the phone call from Lion Greg who together with Lion Lorraine attended the Council meeting at which, on a vote of 5 – 4 our playground will remain as is, and we hope that the upgrade will commence shortly. There was a loud cheer for Greg & Lorraine when they called in to the meeting. Sept 4 - New BBQ installed in Gazebo at Lions Units by Alister T.
Sept 6/7 - Bush Market on 06/09. The market is picking up as the weather improves. Tony informed me the September market had 58 stallholders which included 3 new ones. 07/09, the Clearing Sale – We weren’t sure what to expect given it was being held on Father’s Day. At an estimate, I would say between 200 – 300 attended. There was 740 lots for auction, which started at 9.30am and concluded at 2.45pm. The cooks and servers were kept busy (very at times) for most of the morning. The catering side has now achieved 2 ‘firsts’ for the club – 2 BBQ’s in one day (Connect Event & Mia Mia, 11.05.2013) and catering at a Clearing Sale, neither of which had ever been done. Sept 26 - Lion Tony F advised that our Bush Market signs on the community signage frames at each of town had been removed and thrown on the ground, being replaced by Winegrowers advertising. This is an ongoing problem. Oct 1 - As the club was not successful in obtaining the grant applied from the Heathcote & District Community Bank, the business meeting on 01 October, passed a motion to fund from club funds in total, an amount of $28000 for the construction of the rail trail shelter. Oct 9 – Meeting at the Guide Hall, Lions Greg & Lorraine S and President meet with CoGB and a builder to go over plans for new cupboards in the Lions Den. Some of the current cupboards will be dismantled and re-assembled in the Units Shed for storage purposes. Oct 29 - The 5th Wednesday (and last for 2014) was held at the ‘Gaggle on High’ restaurant in Heathcote. It was pleasing not to have to travel any great distance. 19 members and Partners attended the night. The establishment is now under new management and it was our pleasure to be able to give our support. All who attended attested to how great the meal was. Nov 1 - NON EVENT: Our Gazebo – The Gazebo was to be erected for the first time at the November market near to where our catering trailer is normally situated. Due to early morning inclement weather and a vastly reduced number of stallholders it was decided not to proceed with putting it up. Nov 6 - Two very relevant meetings took place that effect the club. The location & construction of the Rail Trail Shelter and the Lions Playground. The meeting on the Shelter was represented by Lions Peter B, Fay D, Ray J, Jeanette D and the Prez. Also in attendance was Garry Long and Lindsay Clay (Rail Trail), and from the CoGB, Brett Martini and Cameron Allison, together with Joe McMahon of Heartland Log Structures (Builder). The purpose was to discuss and decide on a location. The location where the station once stood is out of contention as the vacant land which stretches from Herriot Street is zoned ‘Residential’ and would take anywhere up to 3 years to have it re-zoned. The other location was where the access track into the town centre between the school and the hospital would traverse. This location ruled unsuitable as it was a case of ‘out of sight, out of mind’ and could lead to vandalism. This left only the original spot on Herriot Street, which was agreed to by all in attendance. At the conclusion of the Rail Trail shelter meeting, Brett Martini (CoGB) met with Lions Greg & Lorraine S at the Playground, now known as the Heathcote Barrack Reserve Play Space. We hope this is a working title only and that some type of formal recognition to Lions will be displayed when work is completed. Work will commence on upgrading the ‘Play Space’ immediately after school resumes in February 2015. Construction will take 5 – 6 weeks. Nov 17 - As part of ongoing discussion with the various parties associated with the Rail Trail Shelter, the President met with the Principal of the Heathcote Primary School, Cindi Bruechert, in regard to car parking for those people using the rail trail. A report on this meeting will be given to the School Council this Wednesday (19th). Nov 19 - The School Council Meeting approved the use of the car park by O’Keefe Rail Trail patrons. Nov 19 – This was a special date for Lions members and guests. The club was visited by 1st Vice District Governor, Lion Maureen Thorpe. As the room at the Union Hotel was too small to accommodate Members and Partners (approx. 50 if all turn up, 55 did), the Dinner meeting on that night was held at the Bowling Club. Aside from the visit by the VDG, it was extra special for Caroline J. Zone Chairman, Wayne Drummond presented her with a voucher and a sheet detailing her Lions service over 20 years. VDG Maureen then presented the Melvin Jones Fellow to Lion Greg – He was chuffed. The club was also presented with the District Governors Competition 2013 – 2014 ‘Best Website’ award. The President was chuffed! Nov 25 – An email received by the President from Leslye Thies advised that the member was resigning from Lions effective immediately. Painting of the Barrack Reserve BBQ shelters commences this date. The work was carried out by Des Ayres. Nov 30 - Former Club Secretary and current Membership Chairman, Daryl Wallace resigns. Dec 5 – President, Lions Jeanette D and Lorraine B attend Morning Tea celebration in Bendigo for International Volunteers Day. On this date a new refrigerator and chest freezer were purchased to go into the Units Shed when the Catering Trailer is moved – Delivered 12/12. Dec 6 – Last Bush Market for the year. Due to a dis-agreement with Market Manager we were hoping to erect the Gazebo but not so. Lions Meredith G, Robin H & Raeleen S erected a small stall under one of the BBQ shelters. Good sales of Cakes & Puds. Only 47 stalls. Dec 9 – Lions Meredith G & Robin H attend Holy Rosary Primary School to present the Lions 2014 Scholarship to Zac Harris. Dec 12 – President & Lion Jeanette attend Heathcote Primary School to present Hayley Cox with Lions 2014 Scholarship. Dec 13 – What a day! 7 members go to Stargazers for their ‘Star-Be-Que’. Full on. Large crowd. Over $1600 raised which included Cakes & Puds. Also on this day, the Lions ‘Carols in the Park was held with an excellent turnout (more than 2013) by the community. Dec 15 - Phone call from Tony Fisher advising he was resigning from Lions and the position of Market Manager due to a stress related problem. Lion Ian O (Market Assistant) agrees to be in charge for January and maybe February, but not beyond then. Dec 18 – Email from Tony Fisher confirming his resignation. On this day it was all hands for the move from residence of C & A for the Trailer and all catering accessories to the Units Shed. Electrical work done previous to allow operation of fridge & freezer, still needs plumbing to be done. Dec 31 - Resignation of Lion Daryl Wallace became effective. Jan 5 - 2 roof ventilators installed in Lions shed at the Units complex. Jan 6 - A meeting of 10 interested members was held to discuss whether the Art Show would be a club event this year. As Caroline has retired and Lion Rosie is unable to fulfil her role as Art Show co-ordinator due to personal reasons it became necessary to discuss the direction the club would take. I can advise that Lions Lorraine S & Chris C have agreed to be joint co-ordinators with other club members offering their assistance. My thanks also to those who attended this meeting for clearing out the cupboards in the Lions Den so that they could be removed. Jan 12 - Lions Peter B & Ray J spent some time removing the top set of cupboards, which had previously been emptied in the Lions Den and transporting them to the Units Shed where they were installed. Jan 14 - The Market committee met to discuss how the problem created by the resignation of Tony Fisher could be overcome. Lion Jean S has agreed to be part of the Market Manager team. Jan 19 – Contract signed between Lions President Daryl Dedman and Joe McMahon of Heartland Log Structures to construct a Shelter of Ironbark timber on the O’Keefe Rail Trail in Herriot St. Cost of the structure to be $28,000 and to be borne in total by the Lions Club of Heathcote. Jan 21 - Lions Fay & Ian Dawson resign. This brings the number of members who have left/passed away to 9 since March 2014. Jan 23 - Lion John Ayres passed away. John joined Lions in August 1977. His claim to fame as a club member was being the ‘Mint Man’ for 14 years. He also spent many winter Saturday mornings selling raffle tickets for the trailer of wood, on many occasion in the company of Lion Bruce Knight. John was a quiet achiever, always ready to put his hand up when able to help out. In the company of Lion Jim Marshall they plied the streets collecting for the Royal Children’s Hospital. A true gentleman in every sense of the word – R.I.P Lion John. Club President thanked Lion Greg who read the Lions service at the funeral and to those members who attended and formed the Guard of Honour when the coffin was moved outside. Jan 26 - On Australia Day we celebrated with Lion Peter B as the winner of the 2015 McIvor Community Award. Well deserved. We let him off cooking on the BBQ that day!! Feb 7 - Lion Jean S took over as Market Manager as from the February market with assistance from Lion Ian O. With 50 stallholders present this was a major increase from the 17 in January. Thanks to Lion Jean for taking on this position, which has allowed the club to continue market operations. Feb 17 - For the first time in many years the Zone Meeting was held in Heathcote. This came about after a strong suggestion from Lion Meredith. Feb 18 - An indication of falling numbers. Not that long ago the room at the Union was almost standing room only for a club Dinner meeting. It would be full to the brim with members and partners, and it was a battle to get a seat……Those were the days. Not so at the February Dinner……18 members and that included 5 partners. Feb 19 - The remaining cupboards in the Lions Den were dismantled in readiness for the installation of the new ones. Feb 25 - New cupboards for Lions Den have been placed there in readiness for installation. Feb 26 - At long last work commences on upgrading the Playground. Security fencing erected and backhoe removes old playground equipment. A joyous day indeed! Mar 22 - Catering staff made an early start (7am) as they catered at the Heathcote Golf Club for a PGA Tournament. Egg & Bacon rolls only. Apr 22 - Long-time club member, Harold Fraser passes away. Harold joined Lions in Greensborough in July 1968 and transferred to H’cote in 1996. He was a Greeensborough Charter Member and holder of a Melvin Jones. Apr 24 - The official opening of the Playground by Lion President Daryl and Ward Councillor Rod Campbell. No-one from CoGB staff attended, even though invited. May 1 - 3 - Lions Art Show. Lion Lorraine S in charge with help from other members. This year the Show had 166 entries with 39 artists participating as well as art work from the Heathcote Primary, Holy Rosary and Tooborac Primary schools. Over 200 people visit the exhibition with 8 artworks purchased. May 15 - Earthworks carried out in preparation for foundation work at Rail Trail Shelter site. May 26 - Lions cater with a free Sausage Sizzle for 'Beyond Blue Bus' at the RSL Hall, from 12noon to 2pm. June 2 - Slab poured for small shed. June 3 - Foundations poured for Rail Trail Shelter. June 4 - Sink and cupboard installed in large Units Shed by Rohan Johnson (Prestige Country Cabinets). June 17 - Small shed erected adjacent to large shed at the Units for storage of Display Stands. June 19 - Lions Changeover Dinner is held at the Heathcote Bowls Club. 66 attend. Catering by Goldfields Catering. Lion Greg Speirs installed as President with Lion Daryl (now IPP) installed as Secretary. Lion Lyn F remained as Treasurer. June 26 - 9 members travel by bus driven by Lion Frank Dailey to Wandong to attend the Lions Wandong/Wallan changeover. July 15 - Lion Allan Smith presented with 40 Year Monarch certificate by President Greg. Members attending the Dinner meeting were shown the new retractable pop-up banner that will be used at community and catering events. July 17 - Resignation received from Ross Jeavons. Plumbing work by Jordan Deller commences at Units shed. Pipe for waste water connected into sewerage. Water still to be connected. Hot Water service requires new element. July 21 - Art Show display screens moved into small shed allowing more space in large shed. Lions logo over Units Gazebo replaced. July 29 – President and Secretary visit Heartland Log Structures to view the first completed section of the Shelter. August 4 - President and Secretary meet with Rohan Johnson (Prestige Country Cabinets) to discuss upgrade to the Guide Hall Kitchen. Rohan to do plan / design for CoGB. Club to meet cost. August 6 - President and Secretary meet with Plumber, Jordan Deller, at BBQ next to Playground to discuss replacement of Downpipes prior to having the Shelter painted and new signage fitted at the front. August 10 - Jordan replaces the 2 downpipes on BBQ Shelter next to playground. August 17 - Advised by Plumber that water has been turned on to Units Shed and Hot Water unit is operational. August 20 - President, Secretary together with 4 other members/Partner meet with Brett Martini and Aaron Lindsay from CoGB to discuss signage for Playground. August 25 - The large sign that had greeted children over many years at the playground entrance was removed by Lion President Greg assisted by Lions Partner Ray Anderson and Secretary Daryl. As the playground was opened in December 1978, we can only assume that the sign has been in place from around that time. With Stage 1 of the Playground upgrade complete the City of Greater Bendigo allowed the Lions Club to remove the old sign. The posts will be removed when Stage 2 work is done in February 2016. The club is hoping that approval will be given to have a Story Board erected detailing the history and the club involvement with the playground. August 31 - Lions Greg S, Lorraine S, Daryl D & Jeanette D attend an update meeting at the Bowling Club on the Great Victorian Bike Ride. It will be a busy time for Lions in December. September 2 - Club member Heather Chynoweth resigns. September 9 & 10 - Rejuvenation (Painting & a 'Tub Up') of BBQ at Playground carried out by Des & Matt Ayres. September 21 / 23 – The 3 sections comprising the main framework of the Shelter were put in place. September 30 - A total of 15, being members, partners and invited Guests attended the Toolleen Hotel for the 5th Wednesday Social Night. October 1 – Lions decals were placed on each end of the 3 BBQ shelters in Barrack Reserve. Many thanks to Lion Greg, Lion Partner Ray A. To Lion Meredith thanks for doing the research into what logos were available. October 6 – Club caters for free Tradie Breakfast at Mitre 10. Jeremy Forbes who is the co-founder of HALT (Hope Assistance Local Tradies), developed a program to assist tradies in dealing with depression, anxiety and other mental health challenges. Jeremy in conjunction with Travis at Mitre 10 organised the promotion of the event. October 7 - Club hosted visitors at the October Business meeting. Sandra Slatter & Vicki Forde gave a very informative talk together with photos on their recent visit to the UK regarding the Heathcote Community Games. October 8 - A meeting took place at the Rail Trail Shelter to discuss the landscaping of the area once the shelter has been completed. Those attending were, Orrin Hogan and Cameron Allison (CoGB), Garry Long and Ken Hanson (Rail Trail), Joe McMahon (Heartland Log Structures) and Daryl & Jeanette from Lions. Items discussed included seating, tree pruning, a general tidy-up of the area and shelter signage. October 16 – Club ordered 6 badges showing the wording, ‘Friend of Lions’ for use by Helpers. October 21 - DG Maureen Thorpe attended October Dinner Meeting held in Heathcote Bowling Club. DG presented Letter & Chevrons to Ray Johnson (30 yrs, now retired), Greg Speirs (40 yrs) & Chris Cail (10 yrs). Attendance Tabs – Lorraine Binney (7 yrs), Jean Saunders (7 yrs) & Lorraine Speirs (13 yrs). Meal provided by Bowling Club ladies. October 24 / 25 – Rail Trail: Roof trusses & shelter roof installed. October 28 - Rail Trail: Gravel topping delivered, spread out on 01 Nov.
November 3 – Rail Trail: Internal seating and Downpipes in place. The internal seating comprises of Red Ironbark (Seat Back) whilst Grey Ironbark was used for the seats. November 3 – Club has catering trailer at Heathcote Show. ‘Friend of Lions’, Frank Dimauro, Jaymee Doolan, Daryl Wallace and Lions Partner, Ray Anderson help out due to a number of members being unavailable. CoGB Health Inspector at the Show, thought Lions Trailer very good, excellent report. November 4 – Secretary was contacted by Joe McMahon advising that Ross O’Meara, Building Surveyor, had inspected the Rail Trail Shelter on this day and a Certificate of Final Inspection had been issued allowing for use of the structure – HOORAY!! This news was conveyed to the Business meeting held that night. November 4 – Lion Frank Dailey (Estate President) reported to the Business meeting as follows:That a meeting with CoGB Councillors will take place on 25 Nov to let them know how the decision on who will take over the Units was arrived at – Some points still need further discussion. Unit occupiers to be notified ASAP when decision finalised. Could be at least another 6 months before all the legal work is finalised. November 7 – Lion Jeanette with Helper Thelma Johnson have a Cakes & Puds stall at the Bush Market. November 16 / 17 – Members from the ‘Friends of the Bendigo-Kilmore Rail Trail’ attend at the Shelter site to commence form work for the 2 external tables and seats. Slabs laid on 17th. November 20 - Seats that were being held in storage at the Heathcote Council Depot were moved to the Shelter site and bolted to the concrete slabs by members of ‘Friends of the Bendigo-Kilmore Rail Trail’. CoGB have cleared some of the area around the shelter in preparation for further landscaping. Signage on front of Shelter, ‘Lions Club of Heathcote’ still to be done. November 25 - On 25 November 2015, Council resolved to transfer ownership and management of the Estate to Wintringham Housing Limited (Wintringham), a Registered Housing Agency. November 26 – Lions Estate President, Lion Frank Dailey, advised Club President and Secretary that he had received notification from Matthew Kerlin, Executive Officer – Community Wellbeing, CoGB that Wintringham Housing Agency has been successful to be the Estate Manager. Tenants to be notified at a Luncheon on 15 December. December 1–4 – Work continued on site clearing at the Shelter. Fence erected for Car Park. Large rock put in place for Plaque. Mulch and gravel topping laid down. Rail Trail sign erected. *December 1 – President advised by the office of Brett Martini (CoGB) that an opening date for the Heathcote –Axedale section of the rail trail will take place on 21 December by Jacinta Allan MP at 9.30am. December 4 – The Great Victorian Bike Ride comprising of 3000+ participants arrives in Heathcote. Lions have the Catering Trailer located on Barrack Reserve to offer food and refreshment. Barrack Reserve has 18 stalls between the Stadium and Information Centre. December 5 – ALL OVER - what an event! Friday at 9am Alister picked up the trailer for a journey to Barrack Reserve where it spent the next 6½ hours as Lions members / Friends catered for the visiting bike riders. The team did a top job. Although not as busy as we expected, it was worthwhile being there and chatting with some of the riders, 2 in particular, one who came from Wollongong and another from Queenstown in NZ. The Catering Manager extends a ‘thank you’ to Lions members, Lyn F, Peter B, Lorraine B, Frank D and ‘Friends of Lions’, Alister T, Ray J, Ian and Fay Dawson, also in attendance Sec Daryl and Catering Manager Jeanette.Saturday morning saw not only the Market Managers (Lions JS & LB) up early to oversee market operations, but a number of members and Friends were also early rises to be out at the Showgrounds by 5.15am to feed the bike riders with egg & bacon rolls. It was ‘full-on’, even before the tucker was sizzling on the hotplate as early morning riders came and asked ‘how long’ and from then on the line for service just grew as the smell of what was cooking wafted over the tent city site. The catering manager assumed we had enough of everything but it soon became apparent this was not the case. The Secretary having to make 2 trips back to the Shed for more bacon. With ‘Friend of Lions’, Jim McHarg doing bacon, assisted by Lions Partner Ray A, and Frank Dailey on Eggs assisted by Alister, we came through the rush with flying colours. President Greg was the money man, whilst Lions Lorraine S and Denise A kept up with the serving. The grandson of Caroline & Alister, Will Tan, ably assisted with keeping the rolls up to the Servers. The whole operation was overseen by Catering Manager, Lion Jeanette, who had done a terrific job in organising both days.Total raised – Friday: $426.00, Saturday: $1071.75 = $1497.75. At the breakfast we used 207 of the 300 rolls taken, not counting those E&B’s eaten by the catering team, plus 10.5 kg of bacon. Over the 2 days we also used 20 doz eggs. A great experience for the club – A great effort by all concerned. NOTE: Trailer suffered a malfunction with lifting/lowering device for the roof when being lowered after Barrack Reserve. Alister has trailer and hoping to have fixed in time for Stargazers on 12 Dec.
December 7 - Lion Rosie Hill resigns. December 9 - Lions President Greg and Lion Lorraine S attend Holy Rosary school to present $500 Scholarship certificate to Student Imogen Nixon. December 11 - Lion Meredith G attends Heathcote Primary School to present $500 Scholarship certificate to Student Josh Moule. December 12 – It is a case of ‘all hands on deck’ as 2 events require members to help out. ‘Carols in the Park’ and catering at Stargazers. With club member numbers at an all-time low (18), we had to approach other groups within the community to assist in running the Carols event, whilst a catering team was required for Stargazers.Carols attracts a crowd of 300+. 10 members & 'Friends' go to Stargazers. We were well received as always. December 12 - Lion Meredith Greet resigns. December 13 – End-of-Year club break-up held at the Heathcote Bowling Club, 31 members, Partners & Guests attend. December 16 - Timber for shelter signage picked up from Joe McMahon and left at 'Kidswood' for routing. December 17 - Lion Raeleen Stuart resigns. December 18 - Final Attendee list (103 confirmed) & Running Sheet for O'Keefe Rail Trail Opening on Dec 21st received from Michelle Stedman at CoGB. December 19 - Signage for Rail Trail Shelter picked up from Kidswood Country. No cost to club, Ken Testa donates. A really top job. Lion Greg & Partner Ray A install Lions Logo on back wall of Shelter. December 21 - Lions, Partners and lots of other people attend the opening of the Axedale to Heathcote section of the Rail Trail by Jacinta Allan MP, Mayor of Bendigo, Rod Fyffe & Garry Long, President of FOBKRT. Sign from Kidswood Country also on display. Sign was taken by Lion Peter B to have it coated in Marine varnish. December 29 - Advised by Lion Peter B sign is ready. Jan 3 - Another historic day for the Lions Club of Heathcote – Sunday, 3 January 2016. On this day, and almost a year to the day since the contract to construct was formalised, the signage proclaiming the Rail Trail Shelter belongs to the Lions Club of Heathcote was put in place. Many thanks go to Lions President Greg with help from Lion Peter B and Lions Partner Ray Anderson and overseen by Site Foreman Lion Jeanette D. It looks great. Something this club can be very proud of. Thanks go to Ken Testa of Kidswood Country who did the wording and Joe McMahon for the timber. Joe of Heartland Log Structures was also the builder of the shelter. I am sure you will agree that the sign is great and very tasteful, blending in nicely with the shelter itself. Many thanks to all at the 'Friends of the Bendigo-Kilmore Rail Trail' who have given their time and expertise in helping the Lions bring our plan to fruition. It can be admired from afar or to shelter from that sudden summer shower or just a place to rest those pedal weary legs. The rail trail from Axedale to Heathcote was officially opened on 21 December 2015. The Trail had previously been opened between Bendigo and Axedale in 2 sections, with it fully opened between those two points in March 1999. Jan 9 - Lion member William (Jim) Marshall passed away. Feb 26 - Advised by the CoGB. The playground site will be opened up this Friday the 26th of February to accommodate the Heathcote Community Games and kids entertainment. In order to complete the finishing touches that include the installation of the hammock, spring rocker and shop counter the site will be closed on Monday the 29th February and reopened on Tuesday the 1st of March. March 3 - The club advised Stewart Beveridge of the Astronomical Society that we will be unable to do the BBQ on 5 March due to a predicted temperature of 38 deg. This was the first time since 4 Dec 2004, when we started catering for Stargazers, that we had to cancel. March 27 - Lions Daryl & Jeanette Dedman together with Lions Robin & John Hutson walk in the Easter Parade as part of the volunteer contingent. Lions from other Bendigo Clubs also attended. We led the parade together with the Lions sponsored Community car which is used by the local Police. April 2 - Lions Daryl & Jeanette farewell Steve Luscombe on his journey around Australia for Autism. The club had made a generous contribution to the cause. May - Over the 12th - 16th Lions Daryl & Jeanette Dedman attended the Multiple District 201, 64th National Convention held at Echuca. 1500 Lions attended from everywhere. This was their first Convention - GREAT! June 4 - Bush Market and Catering Trailer cancelled due to inclement weather. June 17 - At the club Changeover Dinner Lion Frank Dailey (29 years a Lion) was presented with a Melvin Jones Fellowship by PDG Jill Qualtrough. 63 attended. August 1 - Lion Frank Dailey planted 3 'Silver Princess' (Eucalyptus Caesia ssp. magna) trees at the Rail Trail Shelter to replace the one that had blown over in strong winds. The trees were named, "Ray', 'Greg' and 'Frank' after the 3 Melvin Jones holders of the Heathcote club. August 3 - Deb Simpson (CoGB) adised Units President, Lion Frank Dailey that the Tripartite Deed of Agreement had been signed by the CoGB, Wintringham Housing and the Victorian Government's Director of Housing. August 16 - Lions Lyn Furneaux & Jeanette Dedman with car driver Ian Furneaux, travel to Melb to view Christmas decorations. The club has applied to the Heathcote Community Bank for a grant of $5000 to purchase new decorations. August 17 - At the monthly Dinner meeting, new member Ian Davey was inducted by PDG Jill Qualtrough. Ian was sponsored by Lion Jeanette Dedman. September 7 - It was reported at the Business meeting that a TV & DVD player had been installed in the Guide Hall. This was a U3A project. September 13 - After checking on the 3 x Silver Princess at Rail Trail shelter is was noted that they appear to have been poisoned. Lion Frank D advised. September 21 - Diabetes Educator, Paul Skipper, was a guest speaker at the Dinner meeting. October 1 - Bush Market & BBQ catering cancelled due to inclement weather. This was our 3rd catering event for the year we had to cancel due to weather. October 5 (Business Meeting) - Zone Chairman, John Smith attends club Business meeting. Secretary receives resignation from Peter Baldwin. Farmers market will cease operation on 17 Oct. John & Robin Hutson presented the club with a Bannerette from Rosewood, Qld. Lion Lyn Furneaux requested to be a Lion at Large for Nov & Dec. Suggestion that as a Centenary project the club have 3 seats installed along High St, need to contact CoGB. October 9 - Heathcote Lions members Greg & Lorraine Speirs, John & Robin Hutson and Daryl Wallace attend the District Convention held at Strathfieldsaye. October 14 - New Christmas decorations delivered. Stored in Units shed. October 18 - Lions J & D Dedman together with J & R Hutson attend Rail Trail AGM and present a cheque for $4670 to be used to purchase tables and seating on rail trail. Letter received from U3A asking if club has any objection to U3A applying for a grant for new chairs for Guide Hall. October 19 (Dinner Meeting) - Club welcomed 2nd VDG Murray Baud and ZC John Smith. Lion Lyn Furneaux attends Community Bank AGM to receive $5000 grant for Christmas decorations.President suspended Standing Orders to allow for a vote to be taken regarding cancellation of Lions Estate Incorporation. Bush Market has a Facebook page set-up by Lion Jean Saunders & Tarlyn Grant. U3A can proceed with grant application for new chairs. October 23 - Lion Daryl Wallace opened the old Post Office for public inspection. October 27 – Club PA System sold to Lions Club of Kangaroo Flat, $650, delivered at Zone meeting held on 15 November. October 28 - Official handover to Wintringham Housing took place at the Bowling Club. 50 attend, Lions (past & present), CoGB, Wintringham & interested persons. November 26 - Lions members Greg & Lorraine Speirs, Jeanette Dedman and Robin Hutson attend the opening of Kez's Hideaway at Redesdale. The club had made a donation to assist with the construction of the residence. November 28 - Lions members, Greg Speirs, Jeanette & Daryl Dedman, Robin & John Hutson, Jean Saunders, Ian Davey and Lyn Furneaux together with 'Friends of Lions' John Dunn and Grant Baker erect the new Christmas decorations along the Barrack Reserve fence. November 30 - 15 members and friends attend the 5th Wednesday social evening at the 'Gaggle on High' - great night & great tucker. December 3 - Busy day for some! Last Bush Market for the year, 73 stall holders kept Market Managers Lions Jean Saunders & Lorraine Binney busy. This was our best market for many years. Also at the Market, Lions Jeanette D & Ian Davey had a 'Cakes & Puds' stall. In the afternoon, 6 members and 4 'Friends of Lions' headed out to Stargazers for their Christmas breakup 'Star Party'. Members were, Jeanette & Daryl D, Karen Holland, Daryl Wallace (Trailer Tower), Robin Hutson & Frank Dailey. "Friends of Lions', Teri Johnson (Cashier), Kate Taylor, Jaymee Doolan & John Dunn. Very busy and lots of stargazers in attendance. December 5 - A celebration for International Volunteer Day, was hosted by Lisa Chesters MP at the Heathcote Bowling Club. The ‘Thank You’ lunch was held for volunteers and volunteer groups in the Heathcote area. Every member of the Lions club received a certificate along with Lions Partner Ray Anderson, FoL John Dunn and Jaymee Doolan. December 11 - Club Breakup held at the Bowling Club. Well attended by members and Partners. Great day. December ?? - Rail Trail Shelter given a coat of oil by Des Ayres. Second coat applied in early January. January 8 - Lions Jean S, Daryl D & Jeanette D met with Stephen Trompp to discuss the proposed dates and starting time for the Friday Night Market: 17 Feb., 10 March and 21 April, 5pm - 10pm. January 14 - Lions Frank D & Daryl D took the Catering Trailer to the Heathcote Hospital for a 'good going over'. It was given a high pressure wash and clean - Long overdue! January 27 - President & Secretary walk from IGA to P.O. with Aaron Lindsay (CoGB) to organise locations for new seats that Lions are providing. February 2 - Catering for the Rural Finance event, RSL Hall. Attended by approx 80. Club provided 'Egg & Bacon' rolls for breakfast and 'Sausage Sizzle' for lunch. February 7 - Working Bee held at the Units Shed - A good cleanup. February 8 - McIvor Times Front page featured an almost full page photo of the Lions catering team at the Rural Finance event. 'A picture is worth a thousand words'. You can't do better than this. Photo in scrapbook. February 9 - Launch of the Rail Trail Marathon (23 April) attended by D & J Dedman and R & J Hutson. February 13 - Lion Robin Hutson attended a meeting at the Rail Trail Shelter in regard to the cleaning up of the site. March 1 - Moved Lion F Dailey 2nd D Wallace that the club agrees by an 'Expression of Interest' letter to commit an amount of money to be decided on to Wintringham Housing should their application for a grant to construct a further 4 Units is successful. March 4 - The Lions Club of Heathcote cater 3 times a year at events held by the Astronomical Society of Victoria at the Leon Mow Dark Sky site located north of Heathcote. Never have we experienced anything like what happened on Saturday, 4 March '17. Thunder, Lightning and a torrential downpour. In fact we have never, at any catering event, experienced anything like what happened, and it was a real beaut but the cooks kept going as the rest of the members stood in almost ankle deep water and tried to keep things as dry as possible. What an experience for all members concerned. April 16 - Lions Greg & Lorraine Speirs together with Daryl & Jeanette Dedman joined with other Lions in the Zone to walk in the Easter Parade. April 21 - What was to be the last of the 3 night markets being held in conjunction with the launch of the Rail Trail Marathon had to be cancelled due to inclement weather. New picture of the Queen obtained from Lisa Chesters MP. I think the current one was the orginal from when club was chartered in 1971. April 23 - The club caters at the Rail Trail Marathon. Weather a lot better than last year. April 25 - Anzac Day. Lions Daryl & Jeanette lay a wreath at the Heathcote Cenotaph on behalf of the Lions club. May 5 / 8 - Lions Daryl & Jeanette Dedman attend the Multiple Districts 201 65th National Convention held at the Wrest Point Convention Centre, Hobart. May 24 - 50 trees planted at the Rail Trail Shelter by the CoGB. June 7 - 100 years of Lions Clubs International. June 23 - 46th Changeover Dinner. The guest list included, Mayor, COGB, Cr Margaret O’Rourke, Councillor Yvonne Wrigglesworth (CoGB Eppalock Ward), 201 V1-4 District Governor, Naga & Arudsothy Sundararajah Zone Chairman Mentor, Wayne and Mrs Denise Drummond, John Smith, Zone 8 Chairman, Jennifer Jones, President, Axedale Our Town Our Future. Installation of committee performed by District Governor, Naga. 54 attended. July 5 (Business Meeting) - Proposal put to members to consider that Heathcote instigate a meeting with 'Axedale Our Town Our Future' to have a Branch Club set-up in Axedale. July 5 (Business Meeting) - It was moved that the club purchase 100 Tote Bags from AD INFINITEM in Bendigo, $438.00. Bags to sell for $5.00. As part of Lions 100 Year celebrations a gold cake tin containing the 1.5kg cake was released. An original order of 30 was placed at the National Convention, that order arrived on this day. Previous discussion with the Executive had decided that each club member or if more than one was a Lion member would receive a gold cake tin as a memento. July 18 - Zone Coffee held at Flossy's (Heathcote). Total of 8 attended, including 2 active members from H'cote (Daryl & Jeanette) & 2 past members (Caroline & Alister). Aug 2 (Business Meeting) - Members agree to pursue a Branch Club in Axedale. Secretary contacted Jen Jones (President, AOTOF) to arrange a meeting with that group by the following Lions members, President, Vice President, Secretary, Treasurer & Member Greg S. Meeting set-down for 14 Sept in Axedale. 100 Tote Bags collected. Lion Greg showed the Honour Board for the Lions Units, will be hung in the Guide Hall. Sept 4 - Club has visit from 1st International Vice President, Gudran Bjort Yngvadottir and husband John from Iceland. 11 members attend welcome. Greg & Lorraine take them for a tour after they said they were hoping to see Kangaroos - They sure did and took lots of pics! Sept 6 - CEO of Heathcote Health, Dan Douglas addressed the Business meeting on the Heathcote & Dist. Community Plan. Sept 14 - Lions members, President, Vice President, Secretary, Treasurer & Member Greg S attend AGM of AOTOF to put forward information on Lions clubs in general. 17 AOTOF members in attendance. Sept 20 (Dinner Meeting) - As there were no raffle prizes, which was discovered after everyone had purchased tickets. VP Lion Frank, who presided over meeting due to President being away, made a decision the prize would be a FREE dinner at next Dinner meeting. PRIZE WAS WON BY VP LION FRANK DAILEY. Sept 21 - President Lorraine and IPP Greg attend Government House and meet the Governor of Victoria, The Hon Linda Dessau AC as part of Lions 100 years. Lions from other clubs statewide also attended. Oct 2 - Club caters BBQ lunch on Barrack Reserve for 'Groupe Auto Classiche Car Club' from NSW. 43 people, 21 cars. Oct 20 - Night Market re-commences after a winter break. After the success of the Feb & March night markets it was decided to continue with this event. Good crowd and a great night. Wind a little cool. Oct 25 – Wellbeing Breakfast. Everyone disappointed with the poor turn-up. Lions feel that the 2 hours not long enough to warrant bringing out trailer. Advised 80 people expected. Only used 32 bread rolls of the 70 ordered. Lions Partner Ray Anderson towed trailer – Many Thanks. Nov 1 (Business Meeting) - After 12 months of haggling with the CoGB Lion Greg reported that the seats as paid for by the club have finally all been put in place. - What an exercise! We are still waiting for map in Rail Trail Shelter. Nov 10 - It was a balmy evening with a temperature of around 30 for most of the day and only a very light breeze….If ever we were to have a real standout night market then this was to be it. Attending for the ‘Official Opening’ we had Lions President Lorraine, Mayor Cr Margaret O’Rourke and Eppalock Councillor Yvonne Wrigglesworth together with Market Managers and Organisers, Lions Jean Saunders & Lorraine Binney. Stall numbers were slightly down but a good crowd took advantage of the weather. Standout event of the night was '3523' Dance Group who mesmerised the crowd performing to the Michael Jackson hit, 'Thriller'. Nov 16 - DG Malcolm Qualtrough visits the club at its Dinner Meeting. Heathcote & DG Bannerettes were exchanged. Nov 29 - 5th Wednesday Social Outing. 14 Heathcote Members, Partners & Friends (Jim McHarg, Caroline & Alister) travel to Axedale Tavern by Heathcote Health bus & Car. Meet with DG Malcolm & PDG Jill and President AOTOF, Jen Jones. Dec 2 - Bush Market cancelled due to inclement weater. Lion Jeanette & Ian were also to have their Christmas Cake & Pud stall, so many $$$ lost - Market & Cake Stall. Dec 16 - Another very busy pre-Christmas Saturday. Club catered out at Stargazers plus 'Carols in the Park' was held in the evening. Dec ?? - Lion Lorraine Binney reported that the Lions Christmas Tree on top of Information Centre was missing, later found at the rear of the Guide Hall. Luckily only minor damage. Also stolen around this time were a number of Lions Christmas fence decorations. They have never been recovered. Jan 17 - Club approves purchase of Bike Maintenance Station. Cost of $1200 to be divided equally between Lions, H'cote Community Bank and H'cote Tourism Board. Jan 25 - Friday Night Market held on a Thursday due to Australia Day. Jan 26 - Australia Day celebrations in Barrack Reserve. Lions cater. Great day approx 300 attend. NOTE: After the Australia Day celebrations the committee of which a number of Lions were members of, was disbanded, due to falling numbers. The CoGB was advised. Feb 6 - Windows cleaned inside & out of the Guide Hall, Kitchen & Lions Den by Paul Goujon. Senior Citizens windows cleaned on 26 March. Feb 24 - Lions have an information stall at the Axedale Quick Shear event. Not a great success! Feb 28 - 13 Heathcote Lions attend last Dinner being held at Australiana Motel by Wandong Wallan L C. Over 70 attend the night. March 3 - Info stall set-up with Bush Market for Lions Awareness Day. March 9 - Lions catered for the 'Farmers Forum / Lunch' at the RSL Hall. Special guest was Channel 7 Weather Presenter Jane Bunn. Photo of Lions with Jane taken at the Trailer. Also on this day the March Friday Night Market was held. March 27 - Club Finance Committee of L & G Speirs, R Hutson, D Wallace & D Dedman meet to discuss Donations. The list total of $20,750 was approved at the April 4 Business meeting. March 27 / 28 - Lions Gazebo at the Liquidambers repainted by Lions Lorraine B (& son Ben), Jean S & Daryl W. Last painted on 10.03.14. April 4 - The Business meeting was held earlier (6.30pm) to accommodate the presentation by Angel Flight Pilot Rodney Richards. 30 attended from the community and Lions. Club donated $1000 with another $178 raised on the night. On conclusion of the Business Meeting the new sleeveless (summer) jackets were handed out. April 22 - Lions have an Info Stall at the Rail Trail Marathon. Finishing point altered to be at Barrack Reserve instead of out near the rail trail shelter. May 16 - Dinner meeting approves $4000 for the Men's Shed project. May 26 - Lion Christine Cail is presented with a certificate as a Volunteer by Lisa Chesters MP. Christine joined Lions in January 2006. She held the position as a Club Director 2007 – 2008. Since 2008 until present Christine has been the Minute Taker for the Clubs meetings which are held twice monthly. In conjunction with holding this position, in 2016 until present, has also been in charge of Club Membership. Christine also assists at Club catering events. birthday of incoming member, Melissa Nankervis. 18 attended in total and a great evening was had. August - Bike Maintenance Station has arrived and site agreed upon, close to Information Centre. Will be installed when funds available from CoGB. September - Town map installed at Shelter. Bacchus Marsh to raise money for the 'Cure Brain Cancer Foundation'. A Certificate of Appreciation was also presented to the hotel for their generosity in providing accommodation. A total of $20.000 was raised by Brett on his 9 day journey. September 27 - Lions Daryl Wallace, Lorraine Binney & Jean Saunders manned a temporary BBQ at Heathcote IGA to assist in raising funds for 'Very Special Kids'. October - Business meeting approves donation of $20,000 to Bunbunarik Children's Hub, with conditions. October 6 / 7- Lions cater at the Australian Trial Championships held at Sedgwick.....The Rock Hoppers of Sedgwick! Heathcote Lions were ably assisted by Lions from Strathfieldsaye and Golden City Lioness Clubs together with 'F o L' from H'cote. The club not only catered to the general public but made 140 pre-packaged lunches for the Observers. In total 140 hours of duty not including lead-up time and clean up on completion of the event. Lions catered for this event when it was last held at Sedgwick, 5 years ago. October 22 - The car of Lions Daryl & Jeanette was loaded with lots of reading material, namely books & magazines. With many thanks to Lions Chris Cail, Jeanette Dedman & Robin Hutson for assisting with the collection. Maryborough Lions shelves in their bookshop received a boost, not that it was needed…The range of titles is unbelievable.Luckily the car did not have to go over a weighbridge. November 13 - At around 1.00am on the morning of 13 November the Heathcote Mitre 10 was broken into. Later that morning a phone call was taken from Mitre 10 advising Lion Jeanette of the robbery. The only thing taken was $103.00 of Lions cake/puds money. Why break in and only steal $103?? One can only imagine! November 14 - Issue 5 of the DG Newsletter featured, on page 4, 4 items pertaining to H'cote Lions. Great so other clubs can see what we are doing. November 25 - Christmas decorations placed along fence at Barrack Reserve. December 1 - Bush Market & Catering BBQ cancelled due to soggy ground at Barrack Reserve. December 5 - Volunteers Breakfast held at Heathcote Hospital. The event was attended by the following Lions: Lorraine & Greg Speirs, Daryl & Jeanette Dedman, Daryl Wallace, Lorraine Binney, Robin & John Hutson & Jean Saunders together with members of hospital staff and general community. December Business Meeting - Due to poor takings at the Bar which Lions operate at the Heathcote Show, it was decided not to proceed with this from 2019. December 14 - The Friday Night Market cancelled due to inclement weather. Decmber 15 - 'Carols in the Park' cancelled due to inclement weather. December 16 - Lions 'End of Year' breakup due to be held at residence of Treasurer Wallace moved to residence of VP Dailey due to inclement weather. December 24 - A report was made to Police that a Christmas decoration had been stolen from Barrack Reserve - AGAIN! See December 2017. Jan 16 - At the Dinner meeting the matter was raised concerning a request by Sandra Slatter CM in regard to the club donating the Grinstead Lion Twins to be placed in the Lions Sensory Garden/Playground at the Bunbunarik Children's Hub. This will ensure they are preserved for prosperity. The donation was approved. Jan 25 - Friday Night Market cancelled due to extreme heat......40+ deg. Jan 26 - Australia Day celebrations held at the Heathcote Bowling Club. Jan 30 - 5th Wednesday Social outing at the Chinese, Red Dragon. Feb 9 - The Bunbunarik Children's Hub officially opened. Lions Vice President, Frank Dailey presented a cheque for $20,000 to Sandra Slatter to be used in the purchase of playground equipment. Lions provide 'Sausage Sizzle' for those attending the opening ceremony. Feb 27 - 8 members of the 'Friends of the Rail Trail' decended on the Rail Trail Shelter area to carry out restoration work on the 2 sets of tables & seats. Mar 1 - The club donates $120,000 to Wintringham to assist with construction costs for 4 more units. Mar 7 - Gutters on Rail Trail Shelter cleaned by Daryl W with Daryl D and Greg S assisting. April 5 - Lions cater for 'Farmers Forum / Lunch' held at the Stadium complex. Guest Speaker was Heather Ewart, Presenter of the ABC TV program 'Backroads'. 60 - 70 attend the event. In 1998, Club member, Les Peagam and wife, Anne, made a return visit to the UK to visit family. Whilst helping out the Grinstead Lions club at May Day celebrations they noticed that each of the stalls run by the club had a colourful 'friendly Lion' hand painted on wallpaper indicating the purpose of the stall. Anne was so impressed with the Lions that she persuaded the late Bert Hewitt (the creator) to allow her to have one of the banners. On their return, the banner was shown to local club members who were so impressed that a replica was commissioned and they were named the 'Grinstead Lions' to honour the origin. They were used for a number of years at various club functions to brighten up club displays / events. The 'Friendly Lions' have not been used for a number of years and had resided in the Lions Den at the Guide Hall. They were used at a Friday Night Market and it was assumed that they had been returned to the Lions Den. 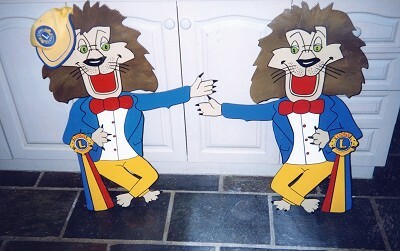 At the January 16 Dinner meeting the club approved the donation of the Grinstead Lion Twins to Sandra Slatter CM to be displayed in Lions Sensory Garden/Playground at the Bunbunarik Children's Hub.This will ensure they are preserved for prosperity. It did come to light when the request was made that since being used at the Friday Night Market by Sandra they had 'resided' at her house, ‘sleeping’ in their studio on top of the barn and were not in the Lions Den as thought. [ 1 ] The Donway Traction Splint is the approved traction splint for upper leg fractures and has been in service since the late 1980's replacing the old Thomas Traction splint. The splint is attached to the foot and hip ends, then pressure is applied by a hand pump which stretches the leg back to it's normal shape, resulting in reduced blood loss and decreased pain, due to a reduction in movement. [ 2 ] The Kendrick Extrication Device (KED) is used in vehicle extrication to remove victims of traffic collisions from motor vehicles or confined spaces. Commonly carried on ambulances, the KED is typically applied by an Emergency Medical Technician, Paramedic, or another First Responder. Typically used in conjunction with a Cervical Collar, the KED is a semi-rigid brace that secures the head, neck and torso in an anatomically neutral position. This position reduces the possibility of additional injuries to these regions during extrication. Rick Kendrick invented the Kendrick Extrication Device, which was first used at a racetrack. [ 3 ] Melvin Jones Fellows - are members who, over many years of service, have upheld the 'Lions Code of Ethics' and given selflessly to their community. The fellowship, which was created in 1973, takes its name from the founder of Lions Clubs International (LCI), Melvin Jones. It is an honour - not an award. The fellowship was established as LCIF's highest form of recognition to acknowledge an individual's dedication to humanitarian service. [ 4 ] This award is named after James D Richardson BEM, who in 1958 was the first Australian to serve as a Director on the International Board of Directors. The award is achieved through making an undesignated gift of $500 to the Australian Lions Foundation, from a Club, Zone, District or other Lions Group that wishes to honour a Lion, Lioness, Leo or a non Lion or group. The nominated recipient will receive a framed and appropriately inscribed certificate and a lapel badge. The document is being updated on a regular basis by Lions Daryl & Jeanette Dedman using the template of the original Timeline done by Dianne Dailey for the 40th Changeover Dinner (2011), in conjunction with research through Minute books, Club Scrapbooks and Newsletters. Additional information has been provided by, Lions Daryl Wallace, Caroline James, Bruce Knight, Ray & Thelma Johnson, Greg & Lorraine Speirs, and Allan Smith, who supplied Lions memorabilia items. Information on the Heathcote Ambulance Service and equipment provided by Danny Lumby. The 'Timeline' does not include all history of the Lions Club of Heathcote, however, every effort has been made to document the major activities and contributions since the Club was Chartered.